The new TomTom Go 40, 50 and 60 units help drivers avoid congestion by offering real time traffic information and routing around the jams by offering Lifetime TomTom Traffic. TomTom GO devices combine real-time traffic information with routing technology to always offer drivers the fastest route available. TomTom Traffic covers all roads and combines data from millions of drivers to deliver traffic information so accurate, it can pinpoint the exact start and end of a traffic jam. The TomTom GO 40, 50 and 60 feature a one touch screen, rich user interface, simplified user interaction, 3D Maps, EasyPort Mount and 'Lifetime Maps' consisting of up to four non-transferable map data updates per year for this product until the product’s useful life expires. Drivers can also choose between a 4”, 5”, or a 6” screen size. Traffic overview: Drivers can see the full picture of all the traffic jams around them. Zoom in for a close-up view and zoom out for a bird's-eye view. Traffic detail: Drivers can see traffic incidents in detail and know exactly which roads are congested, the length of the delay and what is causing the delay. Traffic jam alerts: Drivers know exactly where a traffic jam starts and ends. Drivers receive alerts if you're approaching a jam too fast. Alternative route viewer / Fastest route: Drivers will always be offered the fastest route available. Accurate arrival time: Real-time traffic information ensures that driver’s arrival time is constantly updated and accurate. Lifetime Maps: Always drive with the latest map. For the life of the product, drivers can download four or more full updates of the map onto the device, every year. Speak & GO: Drivers can control the device with their voice. With many useful commands, they can navigate hands-free. Route Bar: Essential traffic and travel information at a glance. The Route Bar shows precise traffic on the road ahead. Quick Search: Drivers can find their destination faster with intuitive search results. Quick Search starts finding destinations as soon as the driver starts typing. 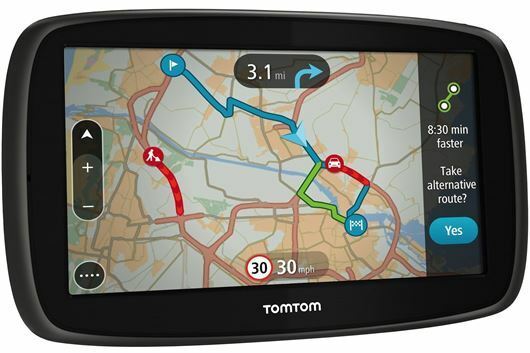 The devices are available at www.tomtom.com priced from £139.